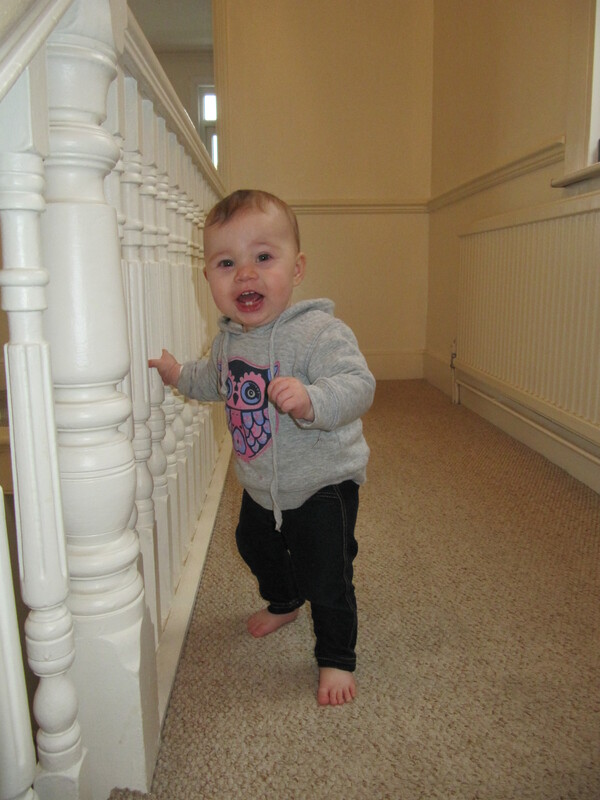 I am growing up so fast mummy and daddy can’t believe their eyes! We went out for a Sunday stroll and I was desperate to take my bike out for a spin as it’s been collecting dust these days. Now I can reach the proper pedals and tried to figure out what to do with them. With this special bike daddy can push it and the pedals move but don’t control the wheel or you can lock the pedals in and then I need to push them myself to get the bike rolling. So daddy thought he would lock them in and try to teach me how to ride the bike on my own for the first time. Here is a sneak preview of how I went. I love reading my books to my little sister. Mummy caught me in action the other day. When one takes it to the dance floor and dances with style and flair using both arms and feet. I can’t believe it has been a month since my last post! The last few weeks have been busy, busy, busy but not in the fun way that I usually have. After my last video I posted about walking, I have improved a great deal, infact these days walking is my preferred choice to get around London. I can’t believe it took me this long to work it out, walking is so much easier and faster than crawling. In a less than two weeks we have to move out of our little studio flat so we have been spending our days searching high and low, all over London for a new place to live. We have been so busy with flat hunting that I haven’t had a minute to blog and have been very quiet on skype as well. I can’t remember how many flats we saw but it was a lot, more than I can count on both hands and feet. Towards the end mummy was getting very frustrated and sad that she couldn’t find the perfect flat. Finally after looking in Southfields, Wimbledon, Balham, Tooting and even Morden mummy and daddy decided they didn’t want to leave Chiswick. We have made so many new friends and there are lots of lovely parks and kid friendly places to eat, we never want to leave Chiswick. The only problem is that Chiswick is so nice, everyone wants to live here, which means it’s very expensive. Luckily mummy found something on the other side of chiswick (she won’t admit it’s actually Acton, but the postcode unfortunately confirms this). This place is so lovely, I get a room all to myself and we have a nice little backyard. I can’t wait to help mummy decorate my new room and play in the garden. Daddy has promised to buy me all new toys becuase I will have so much more room to play with everything as long as I promise to keep my room tidy. The other great thing about our new flat is that there is a spare double bed for all our family and friends to come and visit. Other than flat hunting, we have also had some other fun days, but I will tell you all about it later this week. For now I just wanted to post a quick message to let you all know I haven’t disappeared and to show off this little video of me walking. Mummy filmed this today as it was the first sunny day in over 2 weeks. Only 4 more sleeps till Santa visits and I can’t wait!! Mummy said I have been a very good girl all year so Santa will definitely come to visit. Mummy on the other hand has been very naughty and hasn’t helped me catch up on my blogging so I don’t think Santa will leave her any presents under the tree. Last time I blogged I fed Reindeer and I went shopping, well this week (2 weeks ago) was a super busy and interesting week for mummy and I. 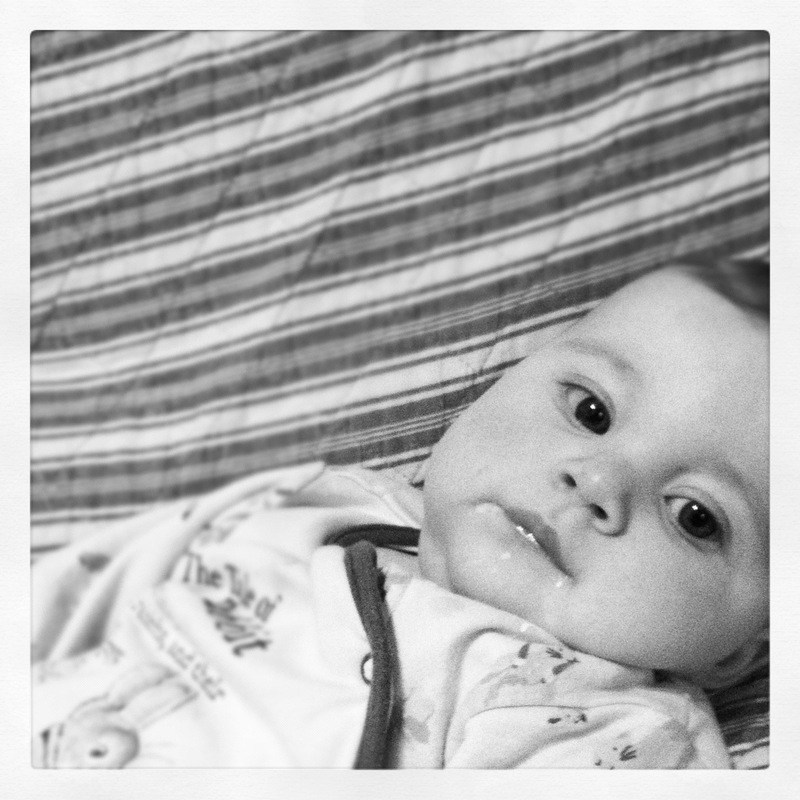 As usual the start of the week was fairly quiet, it gives mummy time to do housework and grocery shopping etc. On the Wednesday when I woke up mummy wasn’t in bed like usual. Daddy got me ready in the morning and packed my bag for the day and we went for a ride in the car. Daddy said mummy had a big day in Norwich, learning how to take pictures of newborn babies. She is always on photography websites and looking at newborn pictures, and so she thinks that one day she might like to make some money doing that and still get to spend plenty of time with me. I think she mostly wants to do it so she can spoil me and buy me all the clothes and toys I want. I didn’t go to work with daddy though, it’s way to dangerous with all his tools laying about the jobsite. 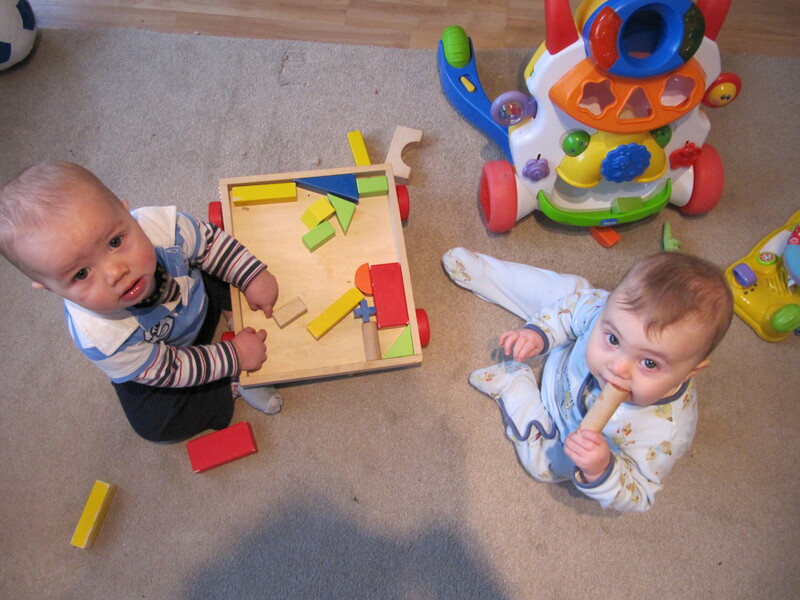 Hammers, nails and stairs are not really suitable toys for babies my age. So daddy dropped me off to Jo’s place and I got to have a girly day with Jo and Lucille. I had so much fun and I was on my best behaviour. Mummy got home late and I was already in bed alseep but I woke up when I heard her voice. I missed her and I know she missed me because she gave me the biggest hug ever and well, she told me so. I stayed up a little bit later so spend some time with mummy and daddy, they were talking about mummy going on the train again tomorrow…. I had no idea where we were going. I didn’t have to get up quite so early on Thursday morning, which was good because I stayed up a bit later the night before. I knew we had another adventure today but I wasn’t exactly sure what was going on. Mummy had packed an overnight bag and we made our way to the tube, all the way to Waterloo station. From here we got on another train but it was different from the tube train, firstly it was above ground and secondly there were lots of fancier seats and a toilet. There is a special spot on the train for handicap or Prams, so we settled in this spot for 90mins until we arrived at our destination – Southampton. We were visiting mummy’s friend from Australia Rebecca and her 3 boys – Oliver, Luca and Jude. They have a lovely house full of toys! I got to play with blocks and cars, trucks and all sorts of new and interesting things. Jude is the same age as me, so I showed him how to crawl, which I have to say, my style of crawling has improved greatly. 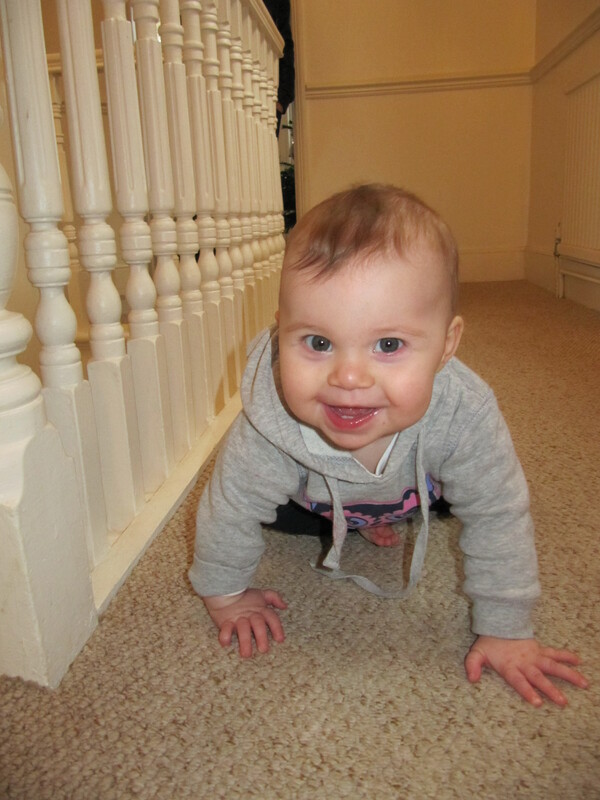 Mummy says I don’t crawl like a slug anymore and I am really quick! I found a fun game where I would chase Oliver into the kitchen, then he would go back to the lounge so I would follow him again, I was his shadow. I was really enjoying all the space to crawl around. All four of us had a bath together, this was the first time I noticed that boys are different to girls, if you know what I mean? They are loud and boisterous, that was what you were thinking as well, right? Hey Santa, can I please have some blocks for Christmas? The boys are really well behaved and went straight to sleep at bedtime, I decided to make a big of noise but after a while I got myself to sleep. I had such a fun day and didn’t know what to expect for tomorrow, this was our week of adventure. I missed my daddy and I know he missed me too, but I think he had a good night with the boys – JD and Pally. 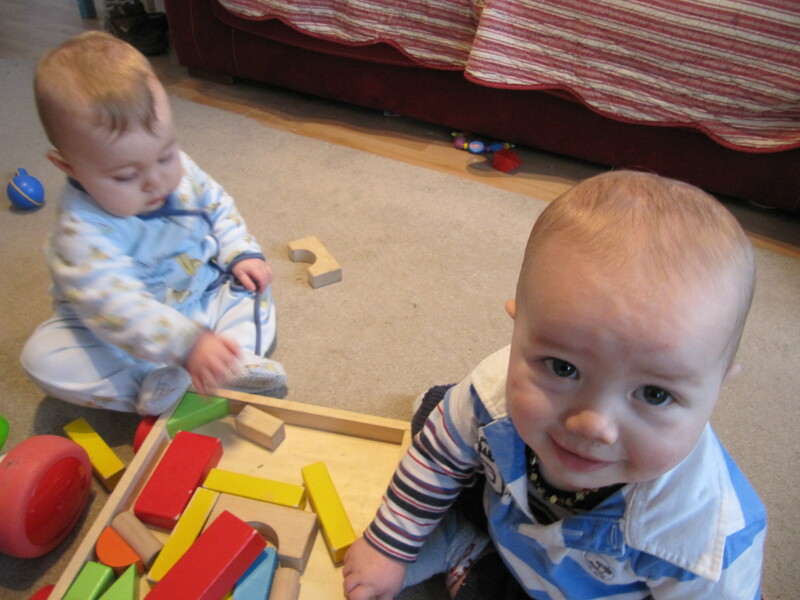 Friday morning was hectic with everyone getting ready even the boys had been up a long time before mummy and I. They were pretty much ready to get out the door and go to Pixies Nursery before mummy and I had breakfast. Oliver and Jude went to Nursery for the day and we went with Bec and Luca to the doctors. It was actually a really cool doctors office, very new and high tech. They had all these games and toys, I played with them all. My favourite was a tunnel but it was more like crawling over a small hill in a tunnel and I wasn’t scared going through it, I had a big grin on my face the whole time. We stayed that night, because Saturday we were on nanny duty. Bec was taking Oliver to Peppa Pig World, which sounds amazing and I hope mummy takes me one day when I am big enough to enjoy all the rides. Luca and Jude are lots of fun to play with and I was very envious of their toy collection. We had cottage pie for lunch and it was my first time trying it and loved it! Must have been Bec’s yummy cooking because I am not usually a fan of lunch. When Oliver came home from Peppa Pig world, he told us all about how much fun he had on all the rides. Santa was there too, man that guy gets around! He also bought mummy a big chocolate lollipop and a lovely T-shirt for me. We had so much fun in Southampton I was sad to go but excited to see my daddy, I missed him. We caught the train home in the afternoon, but my adventure wasn’t over yet…. We didn’t go home when daddy picked us up from the station, we went to Henry and Lucille’s house. Daddy had his work party and his boss is Henry and Lucille’s daddy. Mummy likes hanging out with their mummy Jo, so they bought a few bottles of wine and had a girly night. When I arrived at their house Henry was so excited to see me and immediately wanted to have a bath with me. 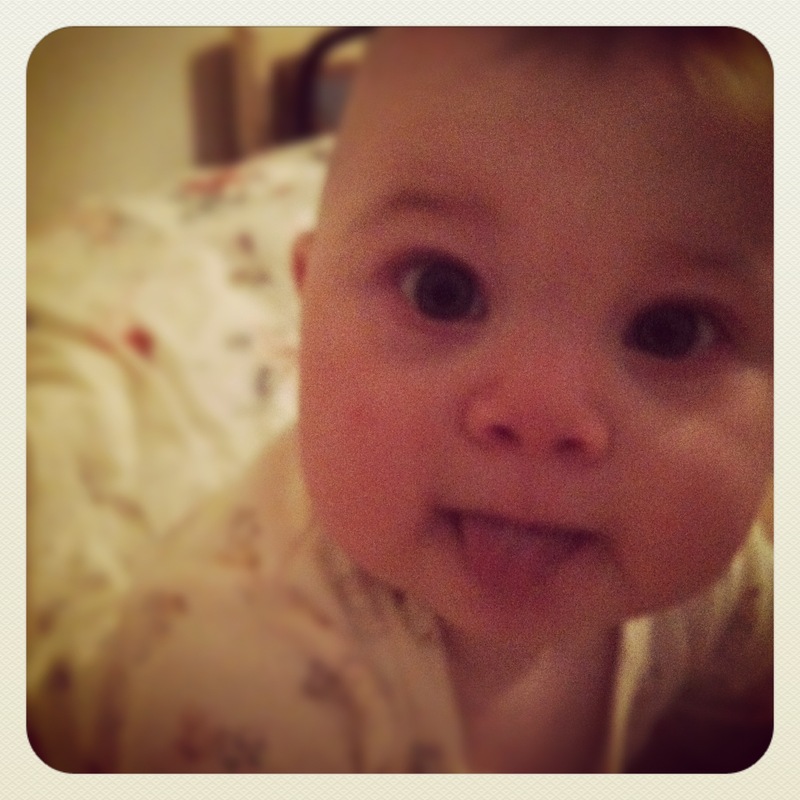 I love Henry, he calls me Baby Harlow. 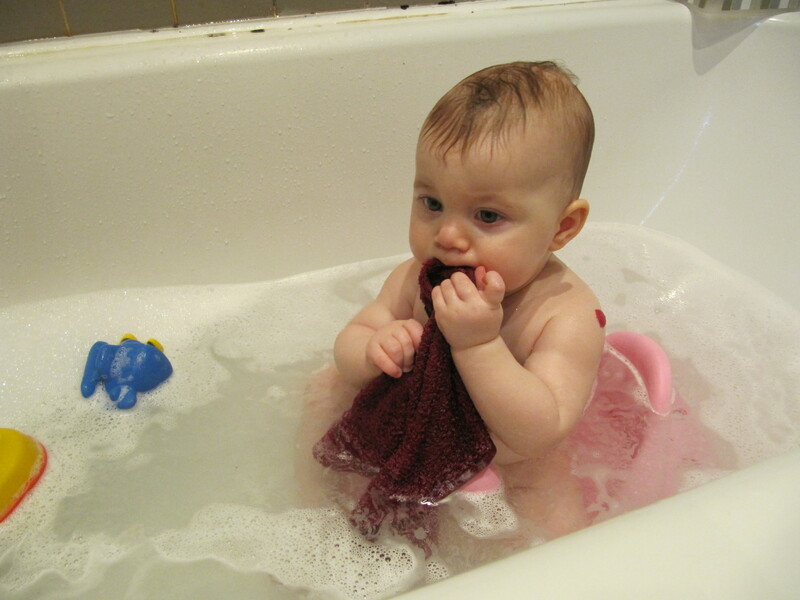 We splashed about and played with his bath toys, then I had some dinner and it was already time for bed. I think that was mummy’s plan so her and Jo could hang out whilst us babies slept. I had other plans though, I took a little while to go to sleep and kept Henry up with my crying, but in the end I got tired and finally fell asleep around 10pm. I think mummy and Jo had a rather late night, as I heard mummy creep into the room at a ridiculous time of the morning, and daddy came home shortly after. The weekend wasn’t over yet, as we had plans for Sunday as well. We slept in for a little bit, which I think daddy was glad for. But once mummy woke up, it was go go go! She literally had to push daddy out of bed, as we had to get home and cleaned up then catch the tube to Southwark. Aunty Kristy was having a farewell birthday/xmas lunch with friends before she jet-setted back to Australia for a holiday with Julien. She was visiting her family in Sydney and showing Julien all the nice things we have back in Australia. I wonder if he will get to see a Koala bear like the one I have in my bed. I bet he will get to swim in the beach, something I never got to do before we moved here. I have heard from Omi and G Nan that the weather hasn’t been nice, so I hope it warms up for them. Mummy and daddy were a little late but they had a lovely roast beef lunch and they dressed me up like an Elf which everyone loved. Kristy has some lovely friends which means I got lots of cuddles, even from the boys! 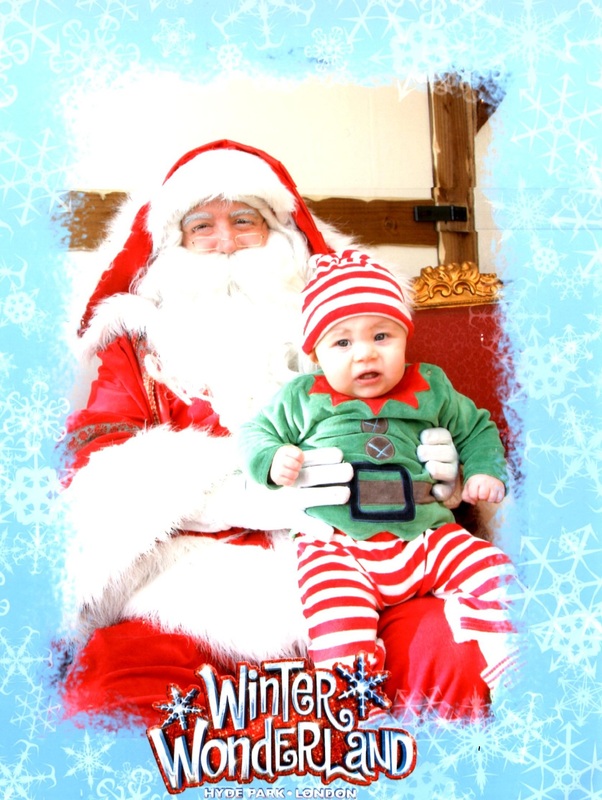 On Tuesday mummy took me to visit Santa in Hyde Park. This was our second attempt as our first was a disaster. This time we went as soon as it opened which was a much better idea than going on a Sunday. There wasn’t even a line up so I got to spend lots of time with Santa telling him everything I wanted for Christmas. To be honest I was a little bit nervous of him, all that white hair and deep voice put me off. I wasn’t my usual smiling self. He was very impressed with my elf outfit and I am pretty sure if mummy wasn’t keeping an eye on him, he might have put me in his sleigh and recruit me to help in the North pole with the other elves. I am still not up to date with everything we have been doing this December, so if mummy doesn’t mind we are going to try and get up to date in this blog because the next few days are HUGE and we might get behind again. I never knew how busy one month could. December is by far the busiest month of the year, not just because of Christmas and New year but it’s also Mummy’s birthday! 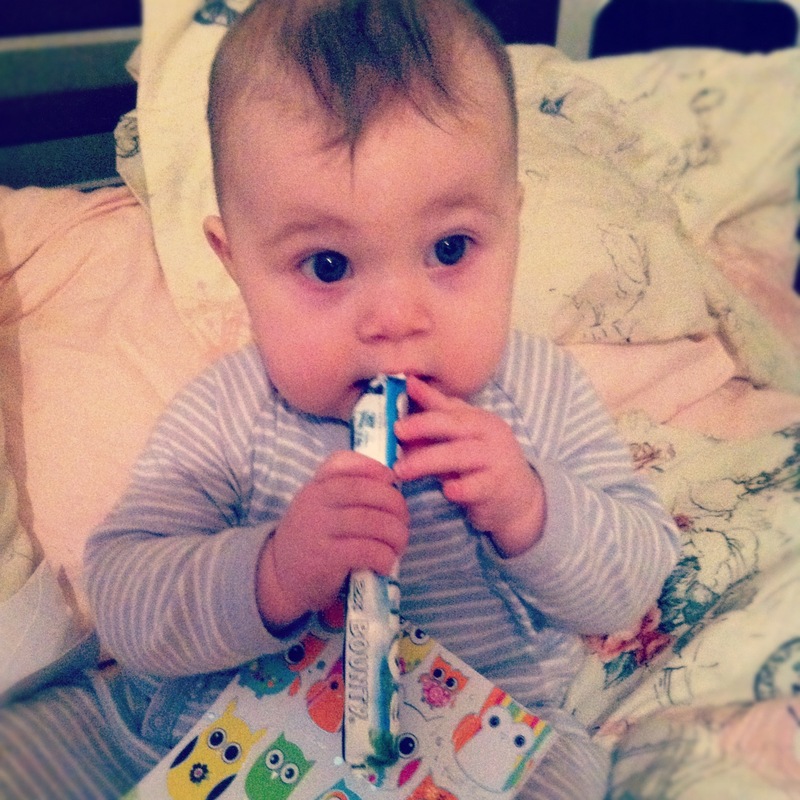 Wednesday 14th December, mummy woke to find me awake in my cot holding a card and a very tasty looking chocolate. I did my best to get into the chocolate whilst she was still asleep but mummy got it away from me in time, and ate it all, I didn’t even get a chance to smell that sweet scent of coconut as she opened it, she ate it that quickly. She had another card waiting for her in the kitchen from daddy, that was just a small surprise to start the day. We met my friends Charlie, William and their mums for lunch at the Crown and Anchor pub in Chiswick. It is kinda of our usual place on a Wednesday, we usually go after Hartbeeps, however Hartbeeps has finished for the year. We spent a couple of hours in the pub, the mummies drank some wine and us babies all slept. When daddy came home, he told us girls to get ready for a night out, he had a surprise up his sleeve. 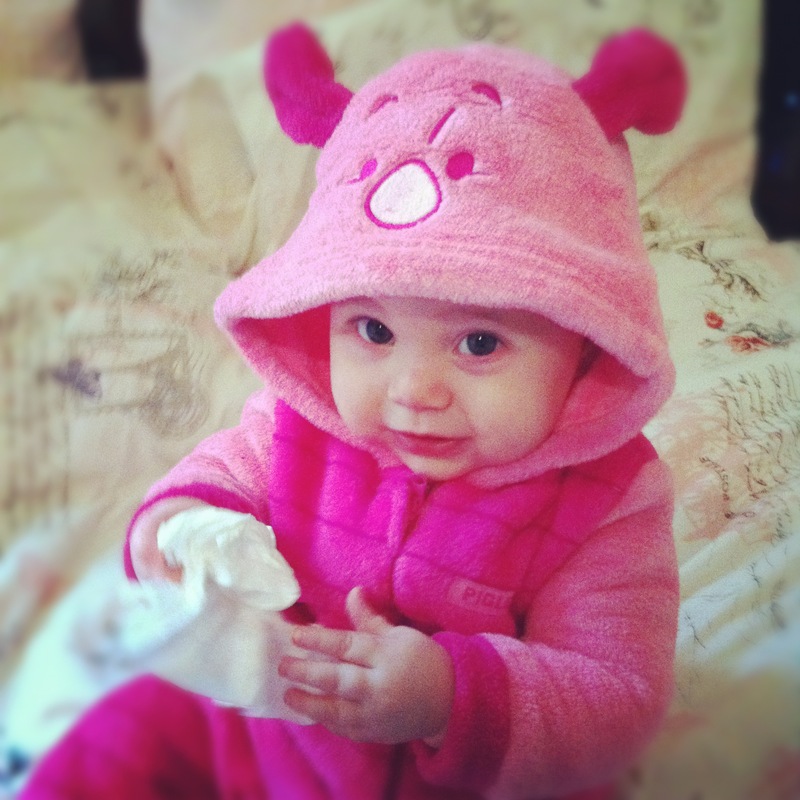 Mummy put on a pretty dress and I just dressed warmly for the night. 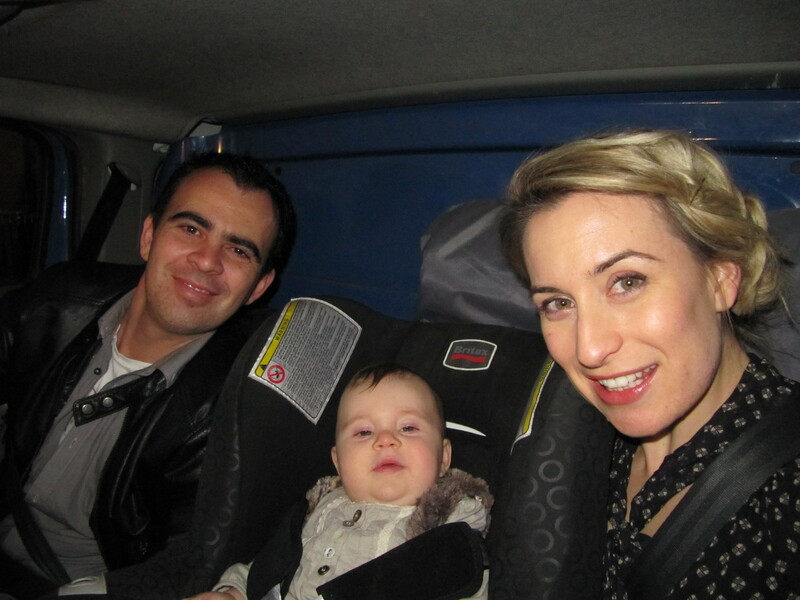 Daddy drove us to Clapham to mummies favourite restaurant in London, El Rincon Latino. Mummy and daddy used to visit this place when they lived just around the corner and also before they got together. They have had some really fun nights there and tonight was another to add to the list. Daddy had organised lots of mummies friends to meet him there and surprise her. I was a good girl and I fell asleep, but I heard everyone partying till quite late. 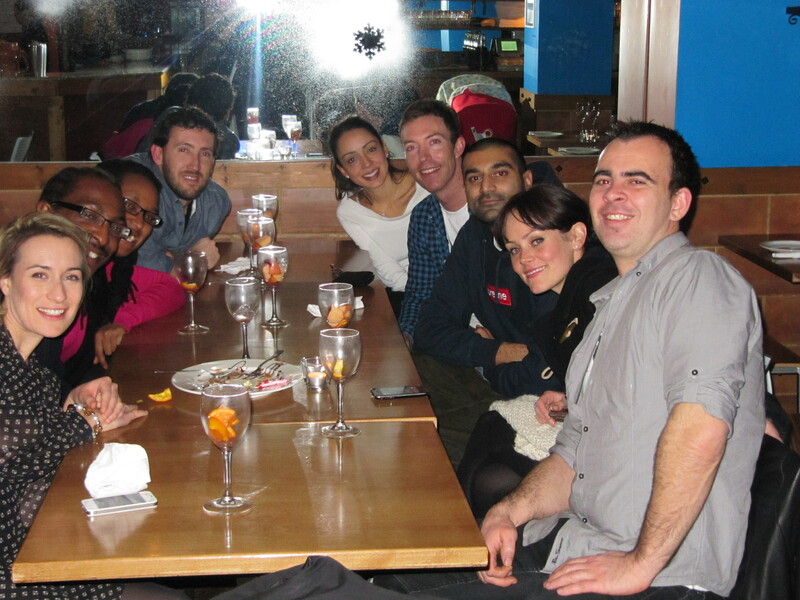 They all shared yummy tapas and drank lots of Sangria. Leroy and Natalie, JD1, JD2, Fran, Jo and Pally were all there to celebrate mummy’s birthday, they all sang very loudly when the cake came out but I was such a good girl and slept soundly in my pram. I think mummy had a really lovely birthday but was sad she is facing her last year in her twenties. We were meant to visit Kristy on Thursday for lunch but mummy and I weren’t feeling very well, she had a sore throat earlier in the week and it had developed into a cough and runny nose, so we spent the morning in bed and later in the afternoon we had to get a few last minute Christmas presents and post them to Australia – sorry everyone my mummy is not known for her timing and I think we may have missed the deadline for presents to arrive in time for Christmas. So we re-scheduled lunch with Kristy for Friday. We caught the bus to Oxford street and met her at her work, we had lots of presents stuffed into my pram as it is Kristy’s birthday very soon and we also had Christmas presents. We had pizza for lunch and mummy even shared her crust with me, it was DELICOUS! I am a big fan of pizza crust. They had a lovely lunch and I was a good girl for the most part. Mummy got very spoilt by Kristy, she got a beautiful gold locket necklace from House of Harlow. Kristy chose very well, because I have seen mummy put that exact necklace in her wishlist for Christmas. She also got a lovely scarf and book, she got very spoilt, as did I. I wasn’t expecting any presents as it was Kristy and Mummy’s day but Kristy surprised me! 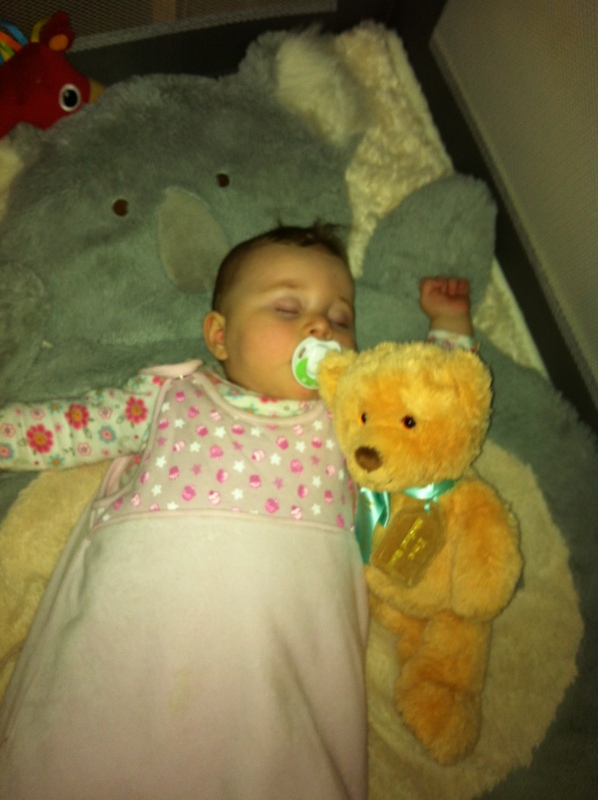 She really spoilt me too, I got the best bear from Harrods, it is so soft and when you turn his tale he plays ‘you are my sunshine’. I also got some lovely clothes and my first Christmas ornament from Selfridges. Mummy wanted to visit Ikea and Toys r Us on Saturday so much to daddy’s disappointment, we made our way there fairly early in the morning to beat the crowds. I am not sure what mummy had to get as she kept everything fairly well hidden in a big bag. Then in the evening mummy and daddy dressed up in some hideous festive jumpers, I don’t know what they were thinking but I wouldn’t be caught dead in a cardigan donning multiple Santas and I am pretty sure daddy was wearing a womans cardigan. They were going to a party in Angel, Rae and Sonders annual festive jumper party. I was spending the night with Sarah and Danny. I really like going to their place, this time they had a Christmas tree and I decided to help re-decorate it. I have lots of fun with Sarah and Danny, I can’t wait for their baby to arrive, I will have another little friend to play with and Mummy and Sarah can hang out together. Crawling around Sarah and Danny's house - catch me if you can! Wow!! so much to catch up on, I am sorry my mummy hasn’t had time to help me blog. We are almost up to date, we just have the last few days to write about, but I might save that for next time. I promise to write again soon as it will be all about Christmas. 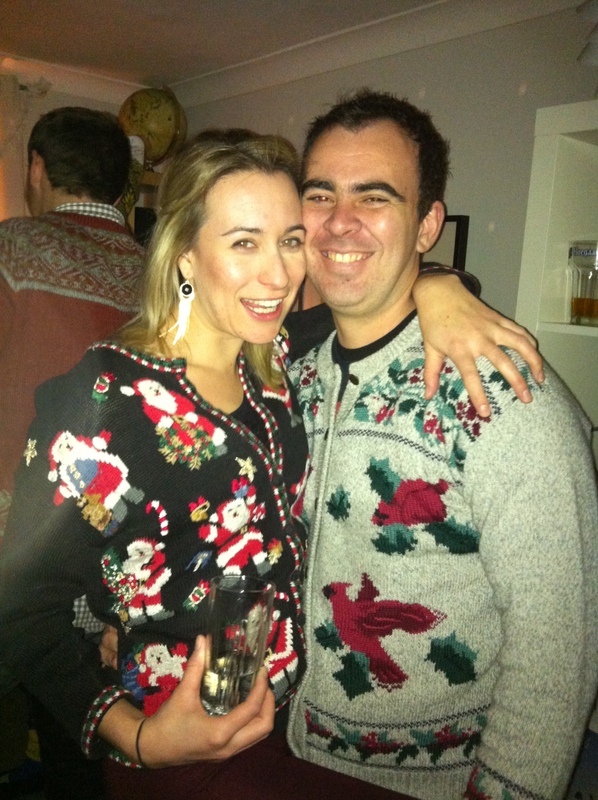 Hideous festive jumpers - what a pair! I think I have remembered everything, other than a few updates on what I new tricks I can do. When we are at home or in the car, I clap my hands to music and start to bob up and down. I can get myself so quickly around the house, mummy sometimes doesn’t realise I am right behind her and almost trips up and finally much to mummy’s delight, I am saying ‘mum mum mum’. I managed to time it well, for her birthday. The other great news is that our internet is fixed, so there really is no excuse to keep this blog up to date. It’s not long till Christmas now (4 sleeps infact) so I hope you all have a very Merry Christmas! There are a few first Christmas’ for my friends Cora, Jake, Ada and my cousin Jordy, I hope they have a very special day and Santa makes all their wishes come true. We have been busy little bee’s this week so here is our weekend roundup. On Friday I had lunch with Sarah, mummies friend from when she used to work in Recruitment. They used to have so much fun, sneaking off at lunch for a glass of wine and going out after work on a Friday. I have mentioned Sarah before because mummy is very excited for her, as she got engaged the other weekend. 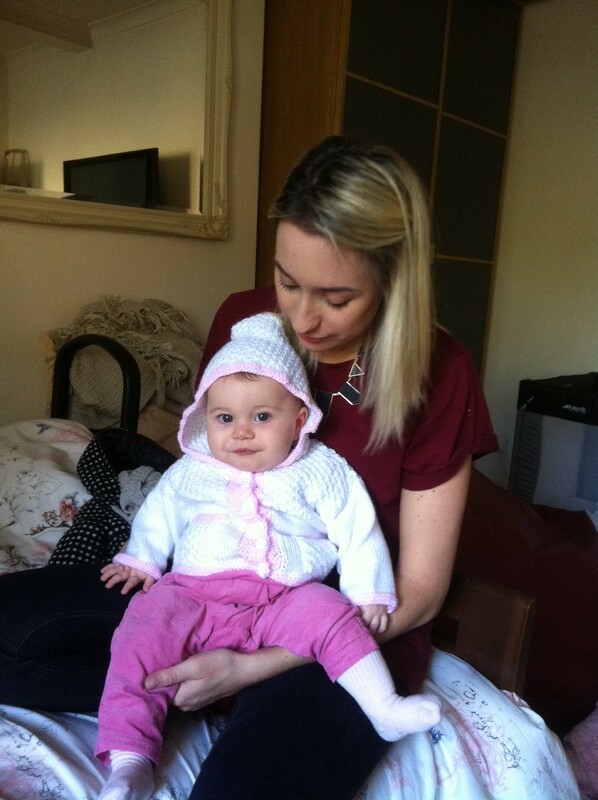 Sarah’s Nan knitted me a lovely white and pink cardigan with a hood. It was a perfect fit and goes lovely with my pink corduroy overalls! On Saturday again we were in a very social mood and had planned a brunch in Wimbledon with Jo and Kristy. I had never met Jo before but I liked her very much, she really like holding me and let me bounce on her lap. Wimbledon Village was quite nice and it was a rather eventful brunch. Firstly mummy tried to give me Pancakes, but I wasn’t really interested,they were a little bit overcooked. They are Brianna’s favourite so I thought I would love them too, I guess I wasn’t in the mood. Then whilst we were having breakfast a group of people rode past in the main street on their horses! You expect to see horses in the country side or on old Macdonald’s farm like mummy sings about, not in the street whilst your in a cafe having breakfast! Then all of a sudden, a pigeon flew into the cafe and there was a big commotion. The poor bird flew into the window but he didn’t hurt himself, I think he was just a little bit scared as he thought that was the way to get out. He got himself into a little bit of trouble in one corner, but then a very nice man caught him and let him go outside and the Pigeon happily flew away on another adventure. After brunch we walked around the shops in Wimbledon. Mummy was very good and kept her money in her wallet. Mummy and I helped Kristy chose some nice new clothes. I did mention to mummy that my wardrobe is looking a little thin these days but she said we would go shopping for us another time. Sunday was a beautiful day, the sun was shining and there wasn’t many clouds. It was fairly warm so we decided to spend it outside. Mummy and daddy took me on a very long walk along the Thames. I think we walked about 5 miles but we had a little break in a pub in Barnes. I was exhausted from being pushed in the pram so I had a little sleep and mummy and daddy played Connect 4 and drank some cider. Daddy is really good and won 3 – 0! We have a few birthday shout-outs this week. Firstly it was my Aunty Melissa’s birthday on Sunday and today is my G Nan’s birthday. I really hope you both had a lovely day. I can’t wait for my first birthday, mummy might even let me try some cake. Tomorrow we have the Virgin man coming out to fix our internet. Fingers crossed he does a good job and we won’t have to go down to Starbucks to use the internet anymore. I know mummy loves the coffee there, but it’s a bit loud for my morning nap. There is always some naughty baby screaming it’s head off! We also have a fun day planned with Hartbeeps and our friends Jo and Lucille are visiting us. I almost forgot to mention that I am mastering a few new tricks. I am really good at walking around the coffee table, talking in gibberish really LOUDLY and clapping my hands. I waved the other day when mummy told me too, but I haven’t done it since. Yesterday mummy helped me learn to walk with my toy walker. I am good at climbing on it when it is sturdy, leaning up against the coffee table and I stand up, but this one has wheels and she set it up in an open space so I could stand up and push it. Mummy held onto it so it wouldn’t run away from me and I slowly pushed it along. I took a few steps and I didn’t think it was that hard. We are going to spend the next few weeks practising until I am confident enough to use it on my own. Mummy usually puts me in my cot with my toys whilst she vacuums and I happily sit there and play. 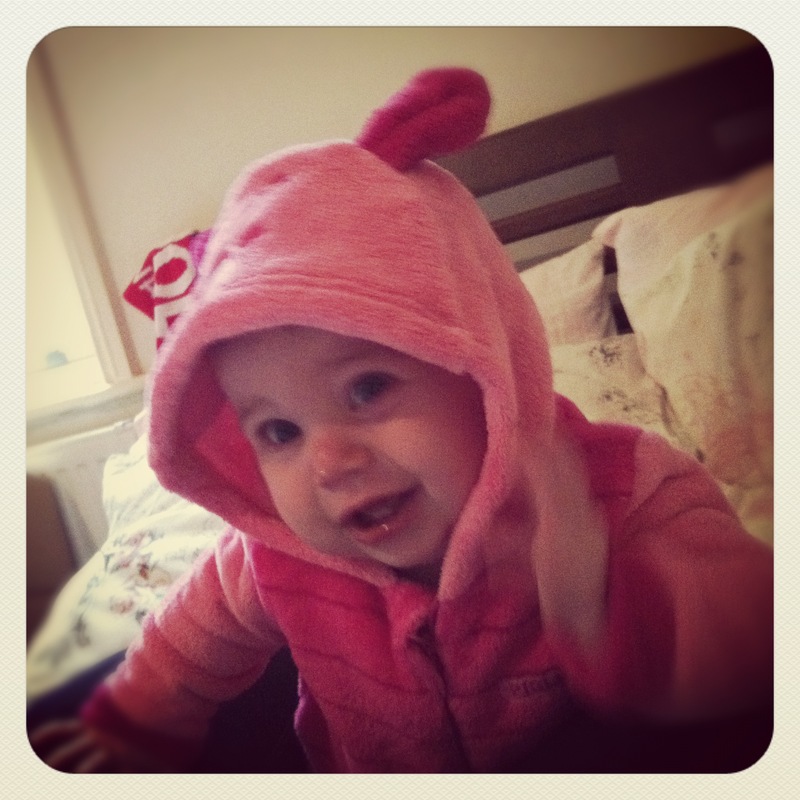 This morning however I decided it was high time that I stand up on my own in my cot and peak over the top and I did it! She was very surprised and luckily she had her phone near by and filmed it. I think it will feature in her next movie montage. It’s my nap time now so I better go lay down, all these new tricks are exhausting.